The principal and the teachers all had it out for him, Jacob said. A likely story, but he does admit to a middle-school career of "graffiti, practical jokes and general annoyance," all leading to multiple suspensions. One day about five years ago he and his friend were sent home yet again. 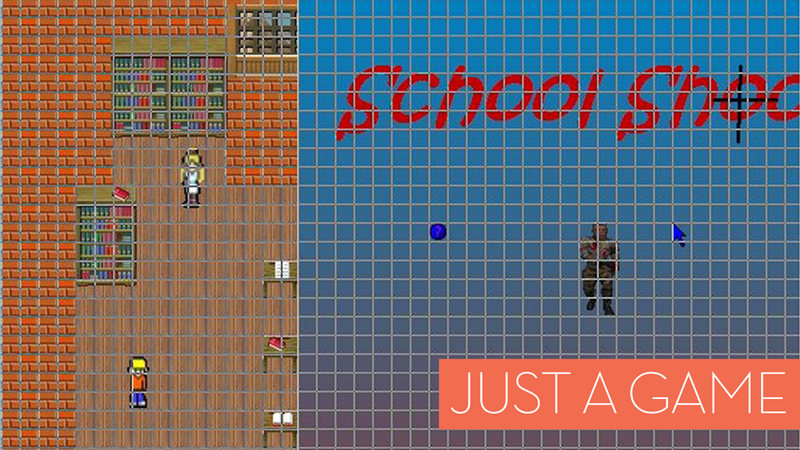 They decided to start work on a video game called "School Shooting." It would end up on the hard drive of the young man who carried out the second deadliest school-shooting in U.S. history. "If people saw what the game was like—I mean, they may—how many could really take it seriously?" Jacob, now 18, said from his home in Massachusetts, trying to find the words to describe his creation. "It's a really bad game." Jacob's "School Shooting" is the game investigators found on the computer of Adam Peter Lanza, 20, who shot to death 20 first grade students and six faculty and staff members of Sandy Hook Elementary School on Dec. 12, 2012. The game's name and its presence on Lanza's hard drive was noted prominently in many media accounts in November, when the state's attorney for Newtown, Conn. released a comprehensive report on the investigation. To some, it appeared to fulfill the image of video games as tasteless, full of wanton violence, and singularly capable of driving others to commit mass murder. Connecticut state's attorney Michael Sedensky, whose office handled the Sandy Hook investigation, was provided with three screenshots by Kotaku and verified that this was the game found on Lanza's computer. Jacob provided a screenshot of the game's source code and assets in Game Maker, a popular tool for novice game programmers. It strains the imagination that Jacob's "School Shooting" could have inspired Lanza's homicidal urges or assisted him in plotting his attack. The game—and only by the loosest definition of "game" is it one—is nearly unplayable, with balky controls that barely can navigate the rushed and slipshod design. It's a top-down maze shooter, basically, and you control a gunman—the Doom guy—as he tours a school firing on immobile targets—the characters from Codename: Kids Next Door. When they're hit, their sprites get red squiggle marks drawn through them. Van Halen's cover of "Happy Trails" plays on the opening screen. The title is the only shocking thing about "School Shooting." "Everything is a joke," he said. "The game was never finished and the development cycle for it lasted about a week in total." Its title, however, is why Jacob asked that Kotaku withhold his last name, a request we are honoring; he doesn't want prospective employers googling his full name and finding dozens of results tying him to something named "School Shooting," much less to Adam Lanza, whom Jacob did not know and never once met, nor anyone who knew him. Jacob reached out to Kotaku because after Sedensky's office released the report, no one knew what "School Shooting" was and some accounts seemed to take it seriously as a game or a game modification. We had never heard of it, and Sedensky's office at the time told us it was "a very basic stand alone PC game." Jacob wanted it known how trivial and amateurish it really was. "People actually believe violent games cause violent outbursts but there will always be underlying problems besides these games," Jacob said. "Millions more people play even more detailed, violent games, and you don't see thousands of shootings a day because of them." Indeed, if Lanza was obsessed with a game, it appeared to be Dance Dance Revolution, which he would play for up to ten hours at a time on weekends at a local movie theater. Forty-three other games were mentioned in the report, which could not determine a motive for the rampage and did not mention video games at all in the conclusions it did reach. But how did Jacob know the game on Lanza's computer is his, and not something made by someone else? "School Shooting" is hardly a distinctive title by itself. Jacob's certainty is in the folder name where it was found on Lanza's hard drive. This evidence report (the original, as provided by Sedensky's office, is in a batch of .pdfs here) shows a folder named "GORM." "Gorm" was an inside joke between Jacob and his friend, derived from the Gormiti Toys action figure line. The executable file they created for "School Shooting" had that name. Jacob stumbled across this reading the evidence report after it was posted to a Reddit group he follows. "I started freaking out when I read that," Jacob said. "No way that could be any other game." Jacob never told his parents about the game he and his friend created, until recently, after discovering the connection. "My mom, she wasn't mad, but she was really surprised," Jacob said. "She was shocked." His friend has told no one of his role in making the game and probably never will, Jacob said. How does Jacob feel about making a "school shooting" game that ended up being played by a school shooter? "I don't regret making the game at all, because I never knew this would happen," Jacob said. "I never thought, in a million years, in one of the deadliest school shootings, the shooter would have played my game. "He probably only played it once," Jacob said, "and then just left it floating around."